Did your phone get switched off due to low battery? How about charging it in a few ... seconds? HYDERABAD: Did your phone get switched off due to low battery? How about charging it in a few ... seconds? How about a smartphone touchscreen that is literally ‘unbreakable’, no matter how many times you drop it? Your luxury sedan requires a critical part that needs to be imported. How does the idea of just ‘printing’ the part at a laboratory sound? Futuristic? Not anymore. We already have the technology, including the preparation of raw materials that goes into these hi-tech products in our very own city. A ‘Make in India’ initiative in its true sense, Nanospan was founded by Silicon Valley entrepreneur Ravi Nuguru in February 2016. Born in Karimnagar, Ravi graduated from REC Warangal and worked in the US for 20 years before moving back to India.Nanospan India is into the manufacture, supply and application of Graphene-related materials. In May, UK-based Haydale Graphene Industries PLC and Nanospan entered into a Memorandum of Understanding (MoU) to collaborate on the development of advanced nanocomposites. “We also have an MoU with Nano Malaysia, a Malaysian-based business entity,” adds Ravi. When working on a treadmill, your physiological parameters such as heart rate, blood pressure, etc. can be displayed on your smartphone, courtesy a tiny chip in your T-shirt. Kevlar-based bulletproof vests weigh anywhere between 15 to 20 kg each. With nanomaterials, the weight and thickness would be reduced many times over, apart from being ‘harder’ to penetrate by projectiles. Graphene can also be used to reduce the weight of an aircraft, thereby improving its fuel efficiency and range. Suppose you want to monitor the pollution in a particular locality. With the help of biosensors installed at crucial junctions, you can easily get the parts per million (ppm) of contaminants and take remedial steps to mitigate the problem, again, using nanomaterials, which can help decompose a pollutant. Nanotechnology helps in detecting the freshness of food and allows tracking of a package through the entire supply chain. 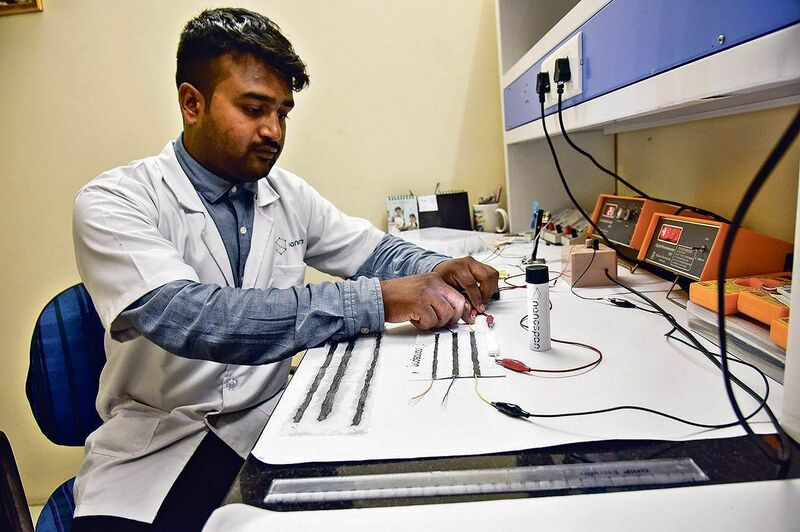 “We appreciate the support provided by Centre for Nanoscience and Technology of JNTU Hyderabad,” says Ravi, and is looking forward to be a part of ‘T-Works’, an initiative of Telangana government for nurturing the electronics industry.Brimming with enthusiasm, Ravi says, “We would soon be having our own prototype-manufacturing lab in the city. We have the resources, talent and cutting-edge technology. 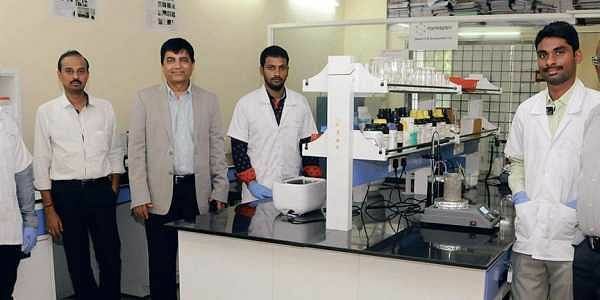 Hyderabad would soon be on the global map in nanotechnology,” and signs off. Nanotechnology is the act of manipulating materials at the level of atoms and molecules. With materials under 100 nanometres, the normal rules of physics and chemistry no longer apply and many materials start to display unique and magical properties. They may become stronger, more conductive or reactive. Graphene is a nanomaterial made from a single layer of graphite and is almost transparent. It is 1,000 times stronger than steel, and is the thinnest possible material. Sir Konstantin Sergeevich Novoselov’s work on graphene with Sir Andre Konstantin Geim earned them the Nobel Prize in Physics in 2010.